Of course government violates the "social contract". Any legitimate social contract isn't going to be what statists claim it is. It's going to be completely voluntary and opting out will always be an option. And you won't have to move away if you refuse to sign, either. 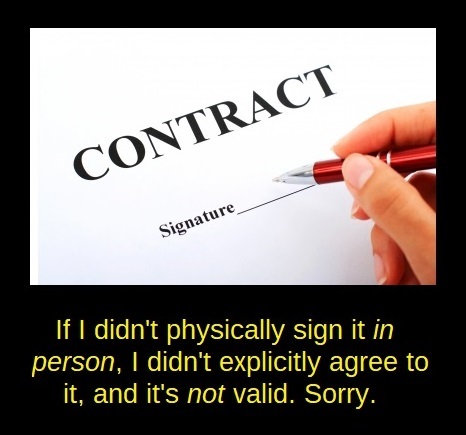 So, why is it that the superstitious beliefs called "the social contract" by statists are always the opposite? They are coercive, imposed systems you can't opt out of. Yet, somehow they believe government-- the one they claim you are obligated to obey and support-- is a manifestation of a glorious "social contract", and this adds to the reasons (in their minds) you should obey and support this government. A true voluntary social contract, which you consented to with your eyes open and without signing away your right to back out if it becomes harmful to your life, liberty, or property, is only damaged by government. It is the opposite of what a real social contract would be. Government is anti-social, and isn't even close to being a valid contract. Sign up with it if that's what you want. It's not for me. Calling government a social contract is nothing but a lie to justify and deny responsibility for systematic violence. The right to defense applies. Statists need to be exterminated, now. We need to start organizing and figuring out how to obtain a nuclear arsenal to kill them all, otherwise this is all pointless. The reality is that we live in 1984 meets Idiocracy, and are being enslaved with stupidity and the bad side of human nature.